Heat oven to 450°F. In large bowl, mix asparagus, zucchini, bell pepper, onion and oil. Sprinkle with 1 teaspoon of the grill seasoning; toss to coat. Spread vegetables in ungreased 15x10x1-inch pan. Place on lower oven rack in oven; bake 5 minutes. Meanwhile, spray 13x9-inch (3-quart) glass baking dish with cooking spray. Pat tilapia fillets dry with paper towels. Brush with butter; sprinkle with remaining 1 teaspoon steak seasoning and paprika. Place in baking dish. Place baking dish on middle oven rack in oven. 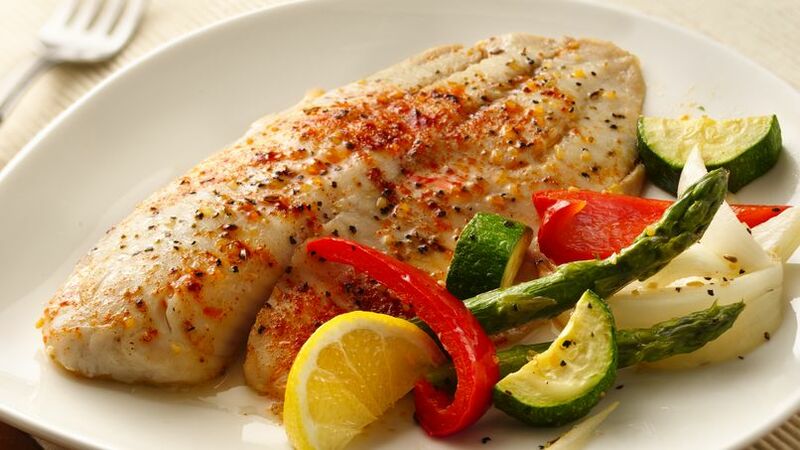 Bake fish and vegetables 17 to 18 minutes longer or until fish flakes easily with fork and vegetables are tender. Any firm white fish fillets can be used. Baking time will vary depending on the thickness of the fillets.